Cargo capacity is also increased from the former model, and is now up to 15.3 cubic feet with the rear seat backs up. The seat backs fold easily with trunk-mounted releases. 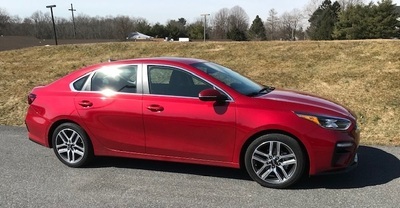 The Forte is powered by a 2.0-liter four, that its basically unchanged from the previous model and delivers 147 horsepower. Power reaches the front wheels through what Kia calls an Intelligent Variable Transmission, which is basically a smart CVT. Performance is decent. The engine is relatively quiet. Yes, it buzzes on hard acceleration, but in cruise mode it doesn’t make a lot of noise. The driver faces a simple instrument panel with a tachometer, speedometer, fuel and water temperature gauges. I had the central information panel set to a digital speedometer, which was handy. In the middle of the dash is a clear infotainment screen. The default screen is a map on the left and audio information on the right. Our tester didn’t have SiriusXM hooked up, so I switched to my old favorite FM stations. Sound quality was good. Safety systems consist of a blind spot monitor, lane departure warning and rear cross traffic alert. All were helpful, sometimes too helpful. For example, the blind spot monitor yelled at me when I signaled to change lanes and it detected a vehicle there. Okay, that was a good nag. Internal storage consists of a deep cubby at the base of the center stack with USB, AUX and 12-volt connections. Above this cubby is a shelf with a Qi wireless charger.